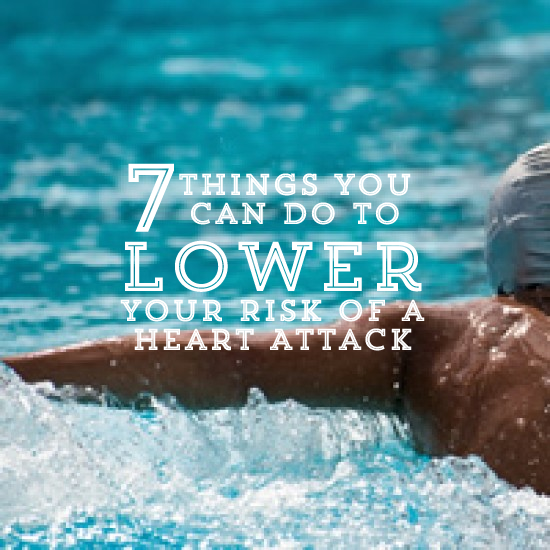 Alt hough there are no guarantees you’ll never have a heart attack, there are some things you can do to lower your risk. The younger you are when you take action the higher the chance you have of being successful. However, it’s never too late to jump into a healthier lifestyle, so get started now. Exercise is essential if you want to have a healthy heart. According to the Mayo Clinic, you need a minimum of 30 minutes of cardio activity three days per week. Ideally, you should get your heart pumping every single day, but skipping a day or two now and then shouldn’t set you back too much. The key is to make exercise a regular habit. You don’t have to run long distances or hang out at the gym. All you need to do is put on your sneakers and take a long walk, grab your helmet and go for a bike ride, or slip into your swimsuit and go for a swim. It might be a little tough to get started, but once you establish a routine, you’ll look forward to it. Most people know that too much saturated fat and sugar is unhealthy, but the Harvard School of Public Health states that adults need a minimum of five servings of vegetables and fruits per day to maintain a healthy heart. Ideally, your nutrition should come from food, but in order to ensure that you get the vitamins you need, take a multivitamin to supplement your diet. Eat healthy fats that are plant based. Nuts, olive oil, and avocado are all good for your heart and help to lower your LDL cholesterol. Salmon and other fish high in omega-3 fatty acids also help to reduce your heart attack risk. Avoid processed foods. Most things that come in boxes that are labeled with ingredients you may not be able to pronounce are devoid of the nutrients you really need and filled with sodium, sugar, and chemicals that aren’t good for your heart. Your body needs rest, so do whatever it takes to sleep at least seven hours per night. If you’re not used to that much shut-eye, you might have a difficult time at first. Establish a sleep-friendly environment by eliminating as much light and noise as possible from your bedroom, going to bed at the same time each night, and waking at the same time each morning. Don’t consume caffeine after noon. Make sure you brush, floss, and visit your dentist on a regular basis. There is a connection between your oral health and your heart condition. The bacteria from dental plaque may enter the bloodstream and cause inflammation of the arteries. If you don’t smoke now, don’t start, but if you do, quit. It isn’t easy, but if you put the effort into discontinuing this unhealthy habit, your lung capacity will improve, and your heart will get the oxygen it needs to stay healthy. You may be able to quit on your own, but if you can’t, ask your doctor for a referral to a smoking cessation program. Eliminate as much stress as possible to keep your heart healthy. It’s difficult when you have a demanding job, lots of bills to pay, and children who demand your time and attention. Stress is a fact of life, but don’t let it get the best of you. Find ways to manage your stress. Get together with friends, take breaks from work whenever possible, play outside with your children, and go on family vacations. Schedule a massage or some other relaxing activity you enjoy. If you still struggle with stress overload, see a counselor who may have some suggestions specific to your needs. Have annual checkups and screenings to determine your blood pressure and cholesterol levels. Your doctor may order more tests based on your medical condition and family history. If you know the numbers, you’ll have a better idea of what you need to work on to improve your heart health.